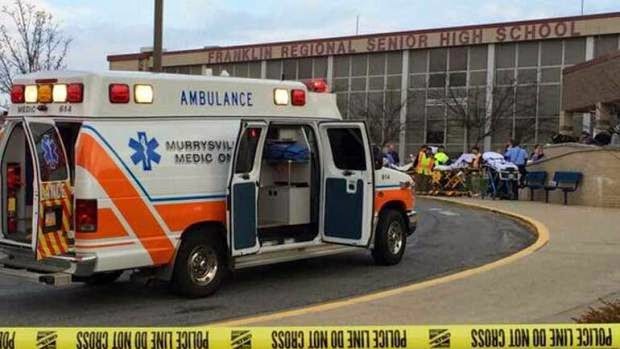 Murrysville, PA – At least 20-people, mostly students have been slashed and stabbed at the Franklin Regional High School here. The bloody scenario played out for a solid five minutes before an unarmed, contract security guard along with a teacher finally overpowered the assailant, 16-year-old Alex Hribal. 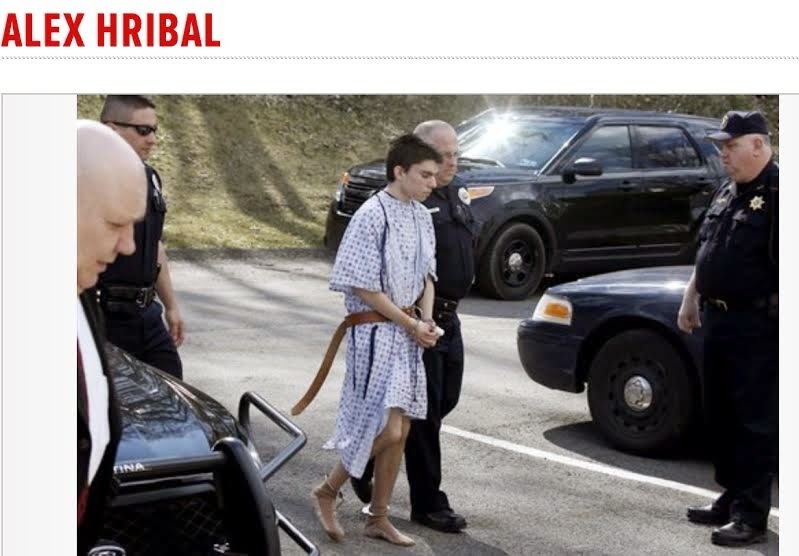 Police said Hribal was armed armed with two simple kitchen knives. Some of the wounded students suffered very serious injuries. The security guard was himself cut and stabbed during the bloody horror fest as he fought with Hribal. It’s anything but a secret that Gun Free Zones provide absolute protection for armed and determined madmen. We all know you can’t hope stop violent armed assaults without superior or at least equal weapons in use by the assailant. We also know that from time to time these terrible things happen especially in Gun Free Zones. It is incumbent upon those responsible for safety and security wherever children are gathered to protect them. They must take reasonable steps to insure events like what happened today at the Franklin Regional High School are stopped cold. Instead, hysterical and institutional gun hatred ruled and the school refused to retain either armed off-duty cops or armed security officers. What they did was to waste taxpayer’s money on an unarmed guard from Capital Asset Protection, Inc. What the school did was simply to hire one more victim or hostage should anything serious happen. The website for Capital Asset Protection does not offer security guards that are either trained with or carry firearms. This school mini-holocaust should have been stopped within seconds or only a few minutes with minimal bloodshed. Had they an armed cop, guard or teacher this event may have never happened because the assailant would have been deterred. Had the assailant been confronted by someone with training and a gun the violence would have immediately ended with or without shots being fired. Instead the young maniac slashed and stabbed his way through the school uninterrupted for what must have seemed to be an eternity. One serious issue that has been ignored by politicians and the media and that’s the use and abuse of prescribed medication for mental health issues. In the past those people who could not cope or function in society were committed to mental institutions. The mental hospitals were emptied and shuttered when these drugs began to replace institutionalization. Most common firearms were not really regulated until the federal Gun Control Act of 1968. Before 1968 mass killings or shootings by deranged people were virtually non-existent. It was also after 1968 when our psychiatrists began dispensing modern mind altering "wonder drugs" on their patients. As for our schools, we’ve surrendered them to radical liberals long ago. The teacher’s unions have made sure that our population is incredibly ignorant while being totally submissive to tyranny. We’ve meekly accepted the Zero-Tolerance mentality that our Leftist run schools invented. Our children are the future. They must be rescued from the Bolshevik educators. That means attending and advocating for your children at school board meetings or home schooling. Our children’s safety is at stake. We all must begin to recognize that guns do save innocent lives. Our children don’t deserve to be put at risk in order to satisfy Leftist political agendas. It’s for the children? Doesn’t anybody think about the children?? You know that is exactly the same argument that the Nazis used when they seized the private firearms from the people of Austria in 1938. That they were doing it for the protection of the Austrian children. Come to think of it, that was the same reason guns were banned in the United Kingdom and Australia – both on the heels of schoolhouse shootings. It makes you wonder about the Sandy Hook Elementary School shooting doesn’t it and how the leftists tried to exploit it in the very same way. Do you think they have a playbook or something? Notice how the media never report when a perp is on legal psychotropic drugs? Almost like they are in hock to the pharmaceutical industry isn't it? Will Illinois now require KOIDs? ?